Pact (Prison Advice & Care Trust) is an independent Catholic charity that supports people affected by imprisonment. 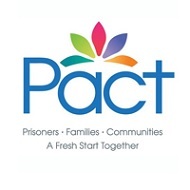 Pact helps prisoners and their families to make a fresh start and to minimise the harm caused by imprisonment to offenders, families and communities. Pact works in fifty prisons across England and Wales, runs seven visitor centres and a number of supervised play services for families of prisoners, as well as raising public awareness of the needs of prisoners and their families.